Flow control systems in oil and gas pipelines often need specialised solutions as well as accurate, fast and reliable ways of alerting operators to any issues due to the often isolated nature of their locations. The upstream, midstream and downstream sectors each play a vital role in the production journey from removing oil from the ground to developing it into a form capable of playing an important role in the daily lives of billions of people and businesses around the world. Field gathering centres, processing plants and transmission pipelines are the main assets in the midstream industry. Diverse fluid power solutions can be applied to the sector to overcome the actuation challenges associated with transporting oil and gas across miles and miles of land and sea. One of Rotork’s proven solutions for flow control in gas pipelines is its robust, compact and modular Gas-Over-Oil (GO) range. The principle of GO is the use of gas pressure in a pipeline as the motive source of power. This pressurised hydraulic oil is then used to operate either a quarter-turn or linear actuator. The quarter-turn actuators operate using either a Rotork GH scotch yoke actuator or a Rotork RH rack and pinion actuator, while the linear apply a LH actuator. All of them will be double-acting, with the major benefit of pressurising the system during the stroke only. The pressurised oil allows for smooth control of the actuator which isolates the cylinder from pipeline gas preventing contaminants entering the actuator’s hydraulic circuit. This can greatly extend the actuator’s life as it is protected from corrosion and seal deterioration. Venezuelan state oil company PDVSA is one of many companies opting for Rotork’s GO range for managing its flow control. The company transports liquefied natural gas (LNG) between the San Joaquin and Jose cryogenic plants to be sold to the international market. Rotork GO actuators are being used to carry out vital failsafe valve control duties on a cryogenic pipeline and are operating 26 in., 20 in. and 12 in. ball valves which have been installed alongside non-return check valves at six points along the route. The extremely remote location of many midstream oil and gas pipelines, some of which are also hard to access, means innovative automated ways of alerting and reacting to a fault are required. GO actuators use a multi-function manifold block which integrates gas control functions, enabling operators to select a range of failsafe and emergency shutdown (ESD) options for pipeline faults including Low Pressure Close, High Differential Open Inhibit and Line Break. High/Low Pressure Close forces the automatic closure of the valve when pipeline pressure rises or drops below a set point while High Differential Open Inhibit prevents dangerous shock waves in the pipeline when the pressure difference between upstream and downstream sides of the valve is greater than a set point. Other optional extras with a GO actuator are available including a Torque Limiting Device (TLD) to limit the actuator’s maximum torque output and prevent actuator or valve stem damage, and a Dehydrator / Filter to remove water from incoming gas. A Line Break can also be included to automatically close the valve if the rate of pressure drop in the pipeline is greater than a set point. This can be offered as either a Pneumatic or Electronic Line Break (ELB). Rotork’s Electronic Line Break (ELB) Detection System is a self-contained electronic monitoring system which can be used in the oil and gas industry to continuously monitor pipeline pressure and provide automatic valve movement to its chosen emergency position if a break is detected. A pressure transducer installed on the pipeline constantly supplies the ELB with the pressure condition in the pipeline itself, allowing for early detection of breaks which initiates the movement of the actuator to a chosen emergency position. The environmentally sealed and explosion-proof ELB casing can be mounted directly on to an actuator or installed remotely, and uses Rate-of-Drop (RoD), Rate-of-Rise (RoR) of the pipeline pressure, as well as set high and low pressure limits, to control the actuator. The RoD or RoR can be adjusted between 0.2 to 20 bars per minute. The control options available are selectable as fail close, fail open or stay put, while a remote Process Shut Down (PSD) input with the ability to override all functions is also available to drive the valve to the pre-set fail position. In the event of a pipeline failure, the ELB also features a range of programmable alarm and alert settings which can be configured to suit specific end user needs. The ELB is also capable of gathering detailed operational data to help optimise pipeline performance and improve safety with the inclusion of a data logger. This information can be retrieved and analysed using a Rotork Bluetooth Setting Tool or a PC running Rotork Insight 2. Remote control is possible using either hardwired connections or Modbus® communication while local controls to command the actuator to open, close or stop are available. The ELB will operate with a supply of between 9 - 28 VDC. Rotork’s GO actuators can provide gas pipeline operators with an efficient way of transporting their products downstream. 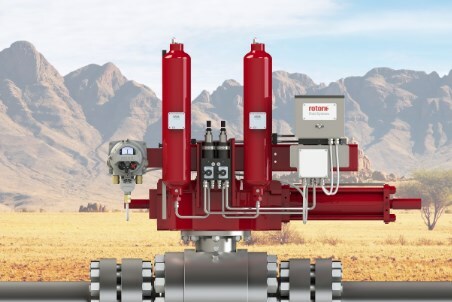 Combining this with an ELB detection system can greatly help end users as it can be configured to quickly command the actuator to move to its emergency position when a signal indicating a large drop or rise in pipeline pressure is received.